In the aftermath of the far-Right terrorist attack in Christchurch on 15 March that murdered fifty Muslims at prayer in two mosques, Turkey’s president, Recep Tayyip Erdogan, used the incident for domestic politics, even playing the footage taken by the killer in public, creating a diplomatic incident. This is the latest case of Erdogan instrumentalising anti-Westernism. The Christchurch terrorist, Brenton Tarrant, made three references to modern Turkey in his manifesto. First, he identified the country, along with China or India—“or some combination of the three”—as the most likely source of an invasion of Europe. Second, Tarrant wanted Turkey expelled from the North Atlantic Treaty Organisation (NATO), in order that a “united European army” could be formed, and Turkey would be “once more back to the true position of a foreign, enemy force”. Third, Tarrant called for the assassination of Erdogan, since this would weaken Turkey’s influence in places like the Balkans, “removing a prime enemy of Russia”, therefore allowing the Russians—an “ethnic European people”—to fill the void. For Tarrant this would have the additional advantage of “destabilizing and fracturing NATO”, an organisation held in contempt for, among other things, rescuing (Muslim) Kosovo from (Christian) Serbia. Tarrant made a further reference to the Ottoman Empire, the last and greatest of the Islamic caliphates, which was dominated by Turks. Tarrant declares it a “triumphant victory” for “we Europeans” when the Ottoman invasion of the Continent was held and turned back at Vienna in September 1683. Tarrant also included a message to “Turks” as a people, that they must be ethnically cleansed from “Constantinople” (Istanbul), a city that Christians must retake. The weapon Tarrant used for his atrocity was cluttered with explicitly anti-Turkish allusions, with multiple references to European commanders in the totemic battles between Christendom and the Ottoman caliphate, such as the 1389 Battle of Kosovo, the 1396 Nicopolis Crusade, the naval Battle at Lepanto (1571), and, again, the siege of Vienna in 1683. Tarrant had drawn his lines in stark civilizational terms—and Erdogan was happy to reciprocate. In 1915, a largely Australian and New Zealander contingent of the British Empire, known as the ANZAC (Australian and New Zealand Army Corps), unsuccessfully tried to knock the Ottomans out of the First World War with a decisive blow by landing at Gallipoli. At an event marking the anniversary of this sanguinary engagement, days after the Christchurch attack, Erdogan said that any Australians or New Zealanders who came to Turkey with the “same intentions” would be seen “off like your ancestors”, many of whom departed “in coffins”. Erdogan’s comments at Gallipoli created a severe diplomatic incident, with the Australian Prime Minister Scott Morrison saying Erdogan’s comments were “highly offensive … and highly reckless”, an “insult the memory of the ANZACs”, and “all options are on the table” if Erdogan did not retract the remarks. Australia even considered reviewing its travel advice for those considering travel to Turkey to mark ANZAC Day on 25 April, which attracts thousands of people every year. A few days later, the New Zealand Foreign Minister met Erdogan on the side-lines of the Organization of Islamic Cooperation (OIC) meeting in Istanbul, and said that the “misinterpretations” had been cleared up, defusing the diplomatic situation. Erdogan’s use of the Christchurch video, however, and his comments surrounding it, were quite intentional. The Turkish government sought to downplay the remarks as having occurred “in the heat of the moment … in an electoral context”, which begins today. But that was precisely their point, to stir a sense of a foreign threat among Turks, which Erdogan’s opponents could be accused of collaborating with and against which Erdogan could pose as saviour. The video played at Erdogan’s election rallies had footage from the Christchurch massacre interspersed with Turkish opposition leader Kemal Kilicdaroglu talking of “terrorism rooted in the Islamic world”, and Erdogan drove home his point by announcing, “Mr. Kemal is hand-in-hand with terrorists!” “This is not an isolated event,” Erdogan added, “it’s something more organised”. Erdogan accused the West of “preparing” the killer’s manifesto and “handing it to him”. None of this is new from Erdogan. 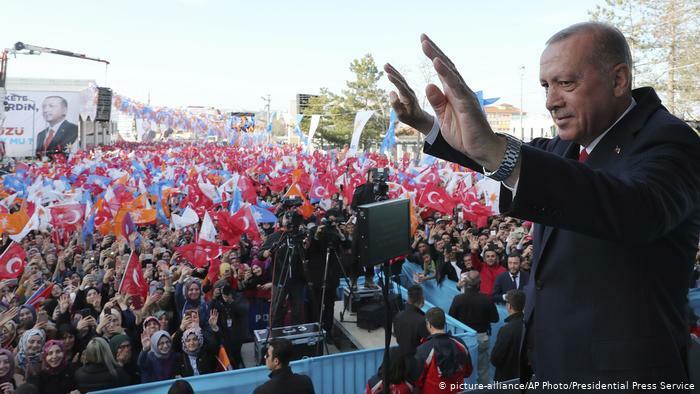 In 2017, ahead of the referendum that increased the scope of Erdogan’s presidential authority, Germany prevented the Turkish government holding an election rally in the country—something that is illegal under Turkish law. Erdogan declared that the German “practices are not different from the Nazi practices of the past”, creating a diplomatic firestorm. A week later, the Netherlands blocked a rally organised by Turkish authorities at their Consulate in Rotterdam, and Erdogan responded that this showed the Dutch government was composed of “Nazi remnants and fascists”. Beyond these election-time shenanigans, the Erdogan government, which completely dominates the media space in Turkey, has been playing on “clash of civilizations” themes and other conspiracy theories pitting Turks against the West for many years. There are television series like “Dirilis: Ertugrul” about Christian crusaders trying to undo Turkey, a barely-disguised allegory for the current situation that Erdogan presents as Europe trying to hold down Turkey’s resurgence. The literary scene is rife with antisemitism, with Jews said to control the West, and Erdogan frequently invokes antisemitic tropes, especially when deflecting blame for bad economic news. Though the Turkish government has become increasingly authoritarian and elections are grossly unfair to the opposition, the votes themselves are generally free, with the accusations of ballot stuffing never substantiated. At present, the election in Turkey is too close to call. There is hope, especially in the United States, that after the elections are over, when Erdogan does not need to inflame opinion to drive voter turnout, relations can be improved. But the structural problems that are creating Turkish-Western friction—particularly the U.S. support for a Kurdish militia in Syria regarded as terrorist by Ankara—will remain.